Want to add satellite TV to your RV, camper, or motorhome? If so, you have three different satellite dishes from which to choose. When it comes to satellite dishes for RVs, you must choose between a portable dish, RV-mounted antenna, or auto-aiming dish. While all of these satellite antennas will deliver the same great programming you enjoy at home, each of these dishes has a specific application. The one you should choose for your RV depends upon what you want out of your satellite dish. Solid Signal has provided satellite dish service, activation, and installation for the RV community for years. We’re happy to take you through the steps to determine which dish is best for you and your RV, camper, or motorhome. A portable satellite dish atop a tripod is a good, inexpensive solution for some RV owners. While everyone loves saving money, this shouldn’t be the only reason you choose a portable dish. This solution is ideal for people who only plan on using your satellite dish a few times a year, such as for tailgate parties. If you choose to get one of these portable satellite TV kits, you’ll have to set it up and aim the dish each time you plan to use it. If you’re only going to watch TV in your RV a few times a year, this shouldn’t be a problem. This is a low-budget solution that’s more permanent than a portable dish. If you’re the type of RV owner who tends to stay a while wherever you park and you want to watch TV in bed, this could be the satellite TV solution for you. We carry a wide variety of satellite dishes that are mounted to your RV, camper, or motorhome. Like the portable solution, these dishes require owners to aim them yourself. Fortunately, it’s rather easy to aim these dishes and Solid Signal provides a tutorial for those who might need a little help. This would be the premier, high-end solution for satellite dishes in RVs. It’s the ideal solution for TV lovers who want to be able to turn their set on and immediately watch their favorite news, sports, weather, and entertainment. There’s no setting up the dishing or aiming it with this option. That’s because your auto-aiming satellite dish is attached to your RV by a professional installer. This is the ideal solution for RV owners who spend a lot of time traveling and want to watch all their favorite shows. Some auto-aiming dishes even let your passengers watch TV while you’re driving! We’ve made it easy for you to pick between a portable, RV-mounted, and auto-aiming dish. But even if you choose between these three types of dishes, you have many choices within that category. 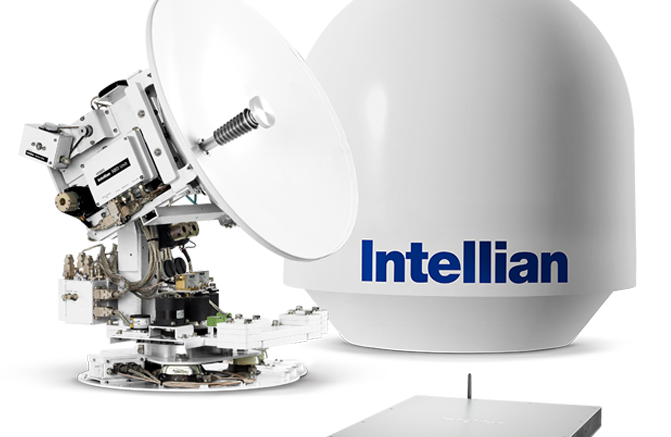 We carry the widest online variety of satellite antennas, which includes products by DIRECTV, DISH, Intellian, Winegard and more. While it might be easy to pick between the three main types of antennas, each of these various satellite dish makers provides a several different models, each with its own features, benefits, and preferred application. We can help you make the best choice for you. Did you know that you can’t get local channels with a satellite dish? If you want to watch the local TV programming wherever you’ve parked your RV, you’ll need to include a TV antenna with your satellite viewing package. This over-the-air antenna gives you access to local programming broadcasts, including the 10, top-10 rated programs that are available for free. It’s a great addition to your satellite TV viewing package. Solid Signal Has Your RV Satellite Solution! Interested in adding satellite TV programming to your RV or camper? Solid Signal can help you with everything you need. Just call us at 877.312.4547 so our satellite dish expects can match you with the right dish for your RV as well as your satellite TV programming package, installation, and more. We’ve helped thousands of RV owners enjoy the wonders of satellite TV programming, and we’d love to help you, too. Call Solid Signal today to get your satellite dish for RVs and more. Compression connectors: Your solution for heat problems?